I wrote about Gainsborough in A Town With Two Stations And Infrequent Rail Services, so when I was in Sheffield, I had to go and have a look at the town. I left Sheffield on the 08:09 train to Cleethorpes and arrived at Gainsborough Central on time at 09:01. I took these pictures on the way. There are seven intermediate stations and several level crossings. There is an interchange at Worksop station with the Robin Hood Line to Nottingham. There is an interchange at Retford station with the East Coast Main Line. Our Class 144 train handled the route with ease at a steady sixty mph or so. Gainsborough Central station only has a train service on a Saturday. As the pictures show, the facilities are basic. Although there is plenty of parking. Gainsborough Central station illustrates the the problems of providing step-free access at some stations. With modern trains or trams, all the tools are there to enable anybody to board and leave the train easily. At present, someone in a wheelchair or pushing a buggy would just use the crossing shown in picture four. The three services a week, probably don’t attract many passengers. How many passengers have used the bridge recently? This is a station, that cries out for a well-designed solution to ensure safety. Marshall’s Yard is a Shopping Centre by Gainsborough Central station. The Shopping Centre is a comprehensive one, with a wide range of shops and a few cafes and restaurants. I was surprised to see an M & S food store. There were several middle-range specialist chain stores. It strikes me, that a more frequent train service to the station might be in the interest of everyone. It took me about half-an-hour and I took these pictures as I walked. I would have taken more, but I was walking directly into the sun and couldn’t see much! Gainsborough Lea Road station is an unusual station, as these pictures show. I would assume British Rail asked the local agricultural building manufacturer to design and build the wooden disabled ramp on the Lincoln-bound platform. A couple of years ago I was coming down from Edinburgh to London in an Inter-City 125, when because of engineering works, we were diverted through Gainsborough Lea Road station. The two routes from Gainsborough to Sheffield join between Gainsborough and Retford and these are pictures of the return journey. I timed this journey, so that I would arrive in Sheffield, to get to Bramall Lane in good time, for the Ipswich match. There were a lot of football supporters on the train, as Rotherham were also at home and the poor old Pacer was creaking at the seams. It certainly proved to me, that the trains working between Lincoln and Sheffield are totally inadequate for the task. The service between Sheffield and Lincolnshire needs improvement. New trains on the services are desperately needed and I will be interested to see in a couple of years, what trains are running the services. The football crowds on the Saturday, showed that a two-car train is sometimes inadequate. I suspect that Northern will run new Class 195 trains on the Sheffield to Lincoln route. These are 100 mph trains, as opposed to the 75 mph of the Class 144 trains. I suspect the trains will have wi-fi and power sockets. Three-car units are on order. They should be a great improvement. The stations are rather variable, with some like Retford and Worksop of a high quality, but others a bit more suspect. Is there also a need for extra stations to serve new developments? The current times from Sheffield are as follows. It is reasonable to assume that the Class 195 trains will better these times by a few minutes. The passenger demand will probably be higher, close to Sheffield. Worksop station has a turnback facility. It is likely, that a Class 1895 train could go from Sheffield to Worksop and back, within an hour. I, therefore feel that an extra service from Sheffield to Worksop may well be possible. In Class 399 Tram-Trains In Service, I discussed the Class 399 trains that are now running in Sheffield. The performance of the Class 399 tram-trains is such, that they could be able to achieve the one hour time for a complete journey to Worksop. If a suitable route from the Supertram at Sheffield to Worksop could be identified and electrified, I don’t see why Sheffield’s new Class 399 tram-train couldn’t run to Worksop. 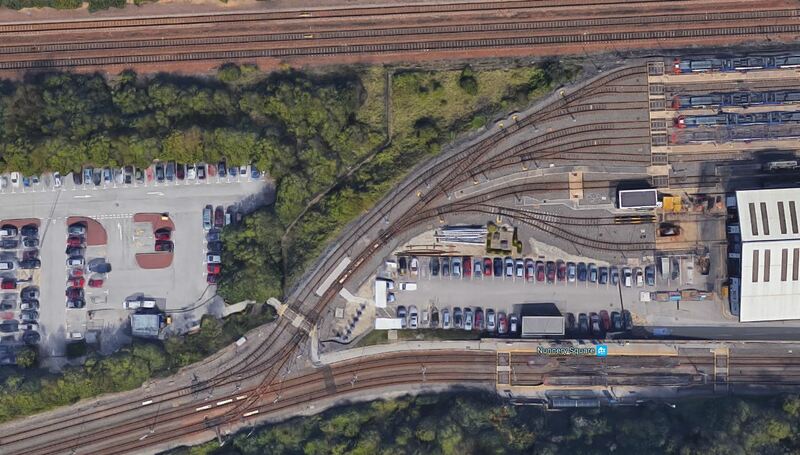 This Google Map shows where the Sheffield to Workshop rtoute passes alongside the Supertram Depot. The Sheffield to Workshop route is the two tracks at the top of the map. The Meadowhall Branch of the Supertram is the two tracks at the bottom of the map. The Nunnery Depot is in between. I believe it would be possible to arrange a connecting pair of track, so that tram trains could go between the two routes. I have assumed that the tram-train route will need to be electrified, but this isn’t necessary. Chemnitz or Karl Marz Stadt as the East Germans renamed it. also runs Stadler Citylink tram-trains, which are similar to the Class 399 tram-trains. But the tram-trains in Chemnitz are different in that instead of being dual-voltage like Sheffield and Karlsruhe, they have a diesel-generator to power them away from the 750 VDC overhead wires. This data sheet gives a few details of the Chemnitz Hybrid tram-train. The data sheet doesn’t specify the power of the diesel powerpack, but the much heavier Class 769 train uses two rail-proven MAN diesel engines of 390 kW each. The service between Sheffield and Lincolnshire needs to be improved. This could be done traditionally using Class 195 trains or creating a tram-train extension. £400K wasted on a “White Elephant” of a bridge when the barrel crossing pictured was sufficient. In 2007/8 when the line was being upgraded we campaigned for better facilities like a timetable notice board, the barrel crossing, better lighting and some shelter on the platform which made a significant difference to the use of the station. Who pushed them into wasting all that money on a bridge from nowhere to nowhere else…. At Thurston and Penistone stations, you just walk across the line and they are a lot busier than Gainsborough Central. Thurston also has a set of pedestrian traffic lights. I suspect, it’s more down to Health and Safety and the lawyers.